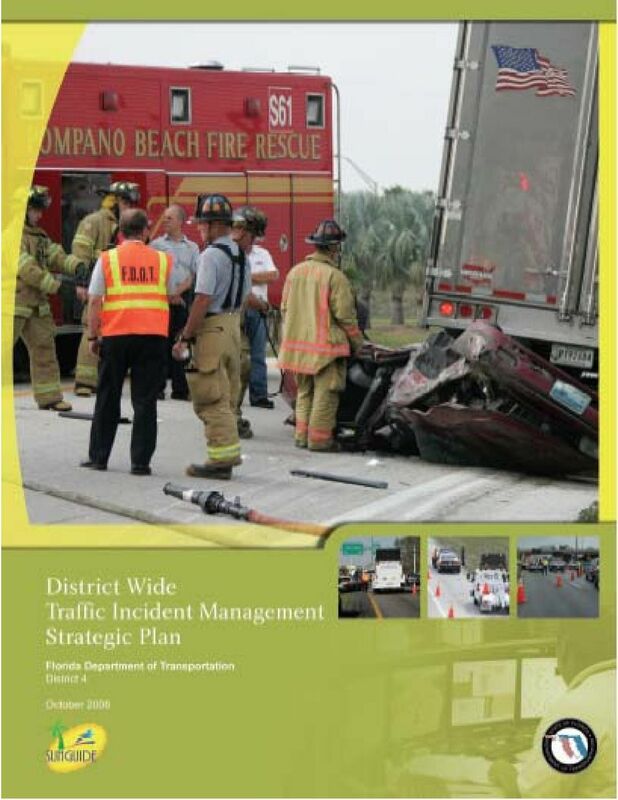 Download "District Wide Traffic Incident Management Strategic Plan"
2 Executive Summary The District Wide Traffic Incident Management (TIM) Strategic Plan was prepared to provide a roadmap for the Florida Department of Transportation (FDOT) District 4 to advance their current TIM program to be a national leader by the year This is critical as traffic incidents continue to account for up to 60% of congestion delays that motorists encounter along our highways. 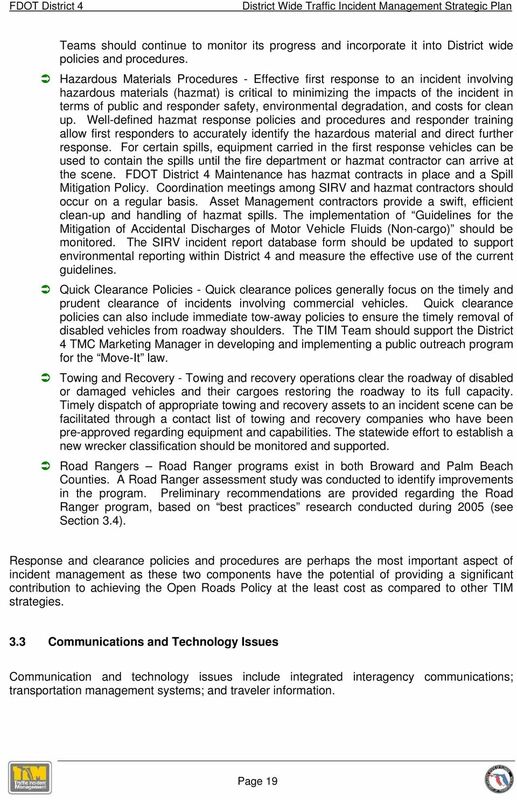 Coordinated traffic incident management is a tool to achieve and maintain public safety, travel efficiency and air quality standards by reducing the impacts of these incidents. 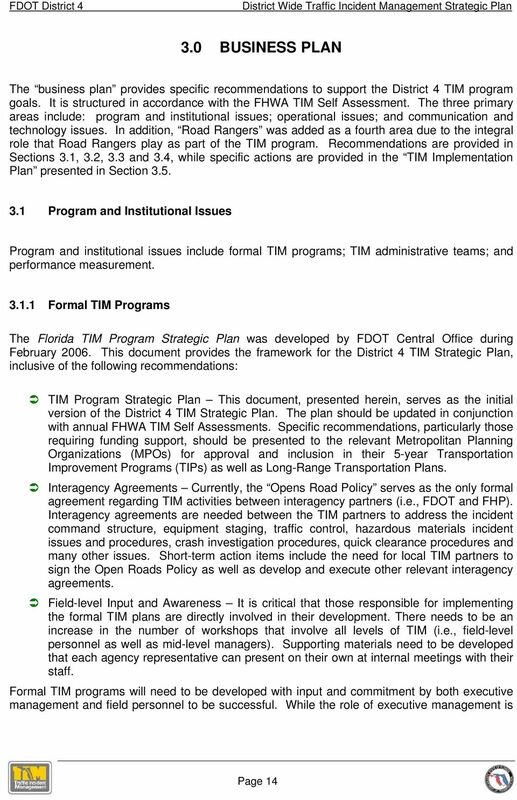 FDOT District 4 has maintained a TIM Team program since the late 1980s. 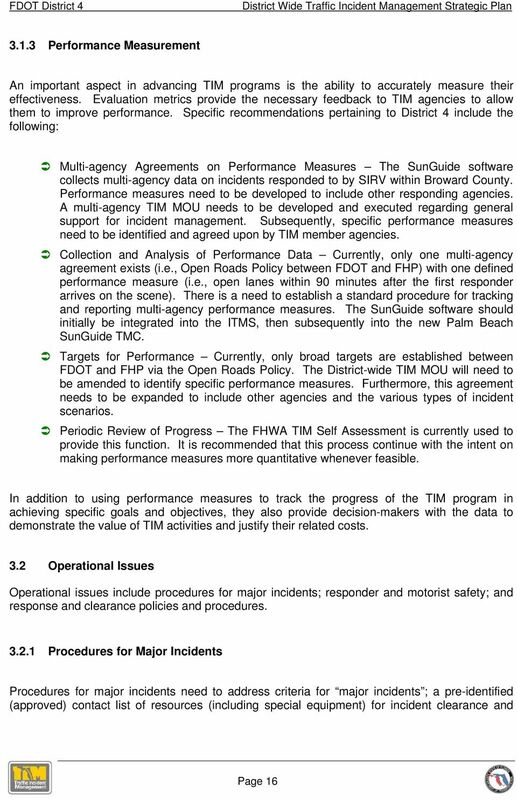 This program was formerly known as Freeway Incident Management with the focus on interstate highways. 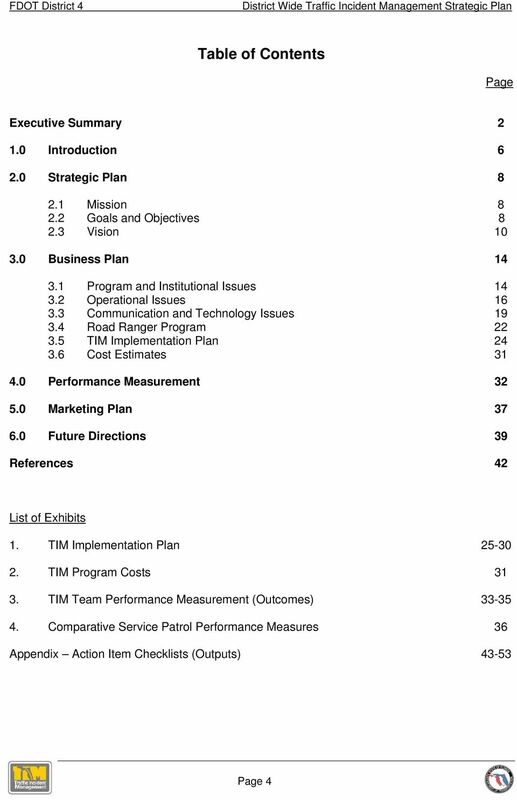 In recent years, the program has expanded to provide coverage of the arterial roadways in taking a system perspective; therefore, the program is currently referred to as TIM. 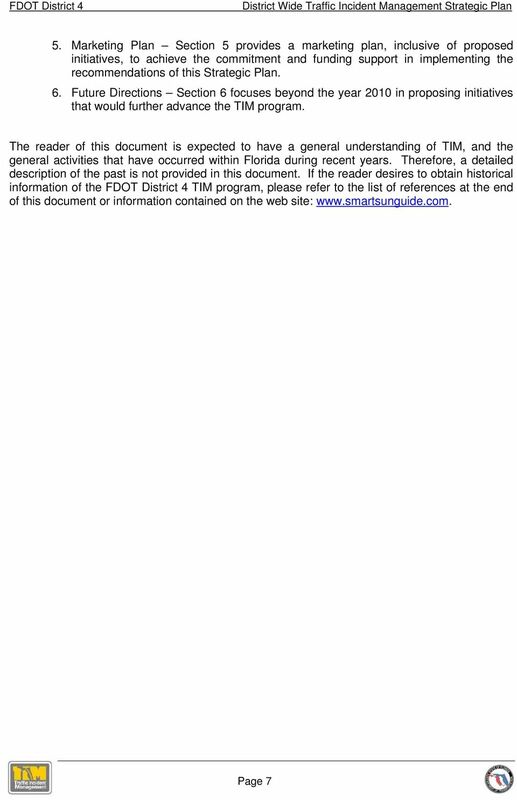 FDOT District 4 currently facilitates TIM Teams in Broward and Palm Beach Counties. 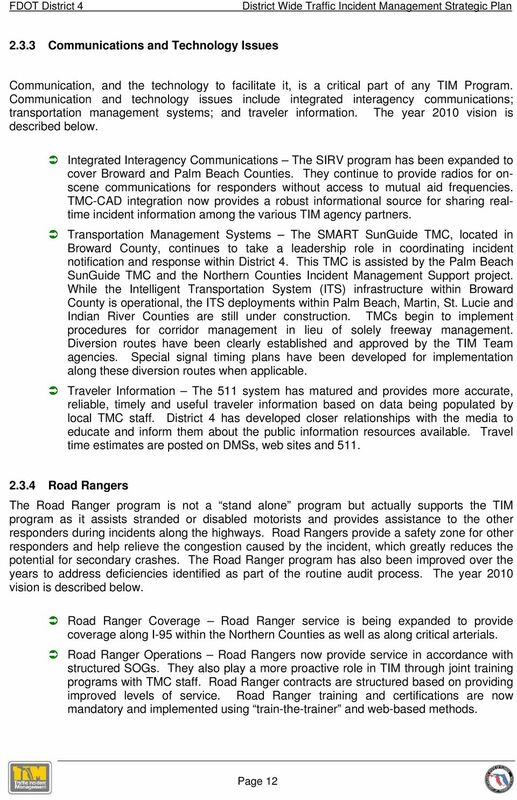 The membership of these teams include representatives of various traffic and emergency response agencies, including Florida Highway Patrol (FHP), FDOT, city police and fire-rescue departments, emergency operations centers, county and city traffic departments, towing companies, and many others who all play an important role in TIM. 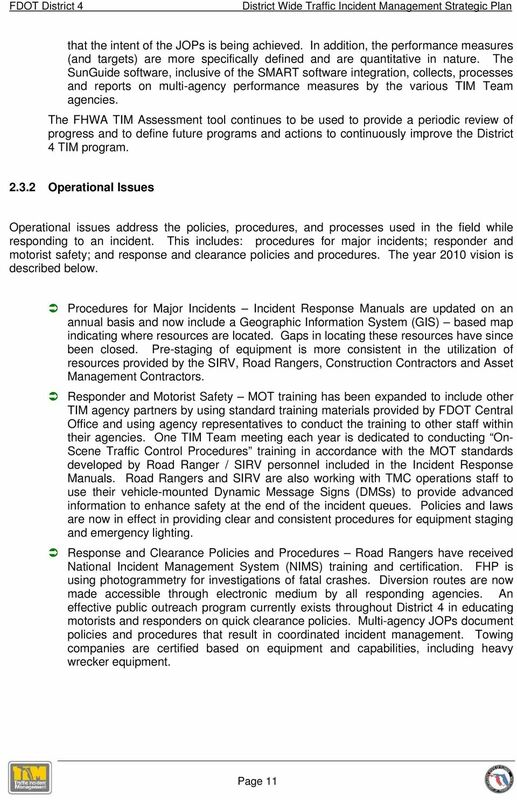 The primary goals of the TIM program is to detect, verify, respond and clear incidents as quickly as possible to reduce traffic congestion, reduce the probability of secondary crashes and to provide a safer working environment in allowing emergency responders to conduct their roles and responsibilities. 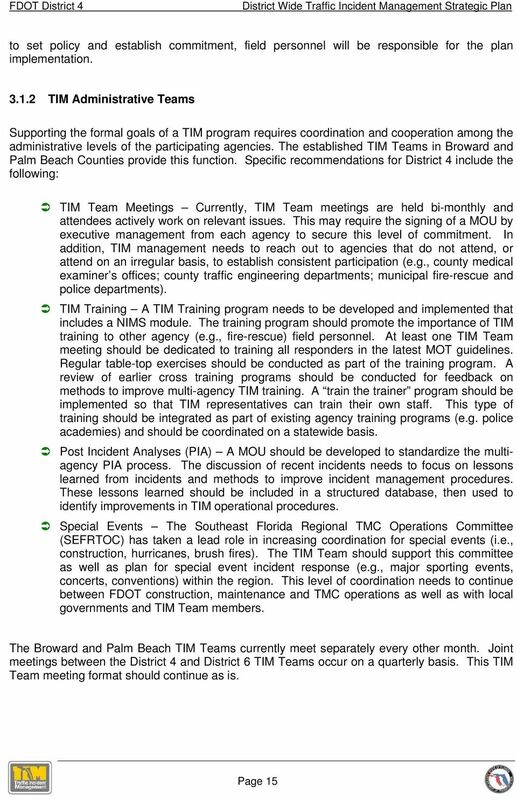 In recent years, FDOT District 4 has migrated to a proactive approach to the TIM Team meetings. 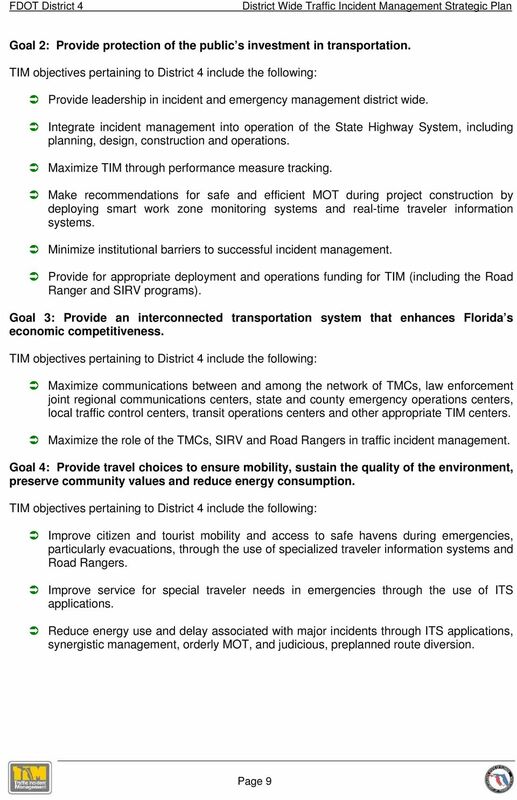 During the past three years, the TIM Team meetings were organized to include direct input from the attendees in the development of products that has advanced the FDOT TIM Program. 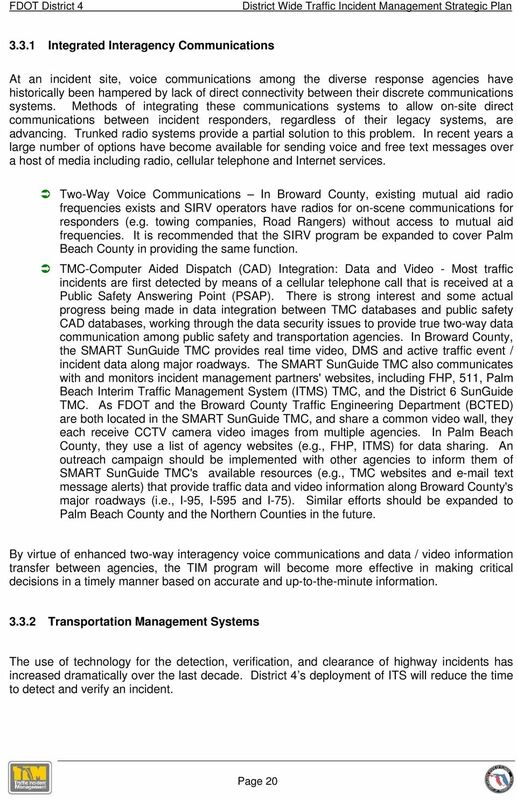 Recent accomplishments of the District 4 TIM program include the following: development of the Palm Beach County Incident Response Manual; development and deployment of the successful Severe Incident Response Vehicle (SIRV) program in Broward County; development and application of the SMART (System Management for Advanced Roadway Technologies) software, which was subsequently integrated into the statewide SunGuide software, to improve the tracking of incidents; development and implementation of an incident alert system; Road Ranger audits and assessment; design, procurement and installation of personal data devices for collecting real-time Road Ranger data; and many other initiatives. 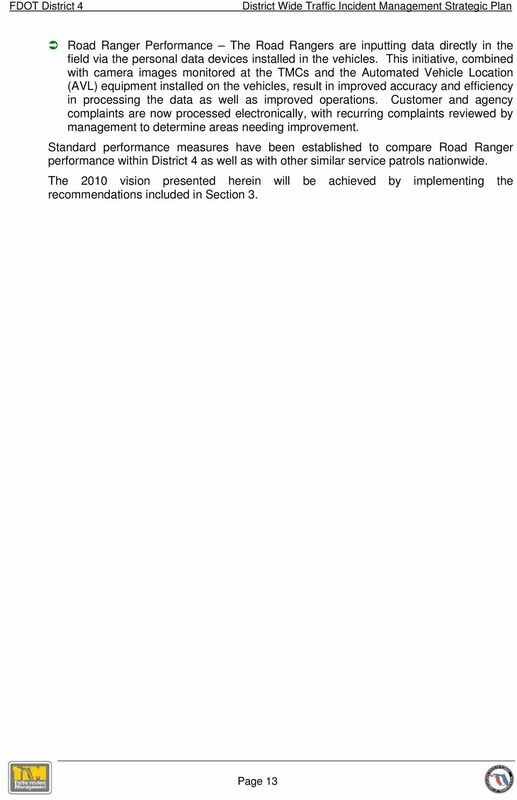 While FDOT District 4 is proud of its accomplishments, there is more work to be done. 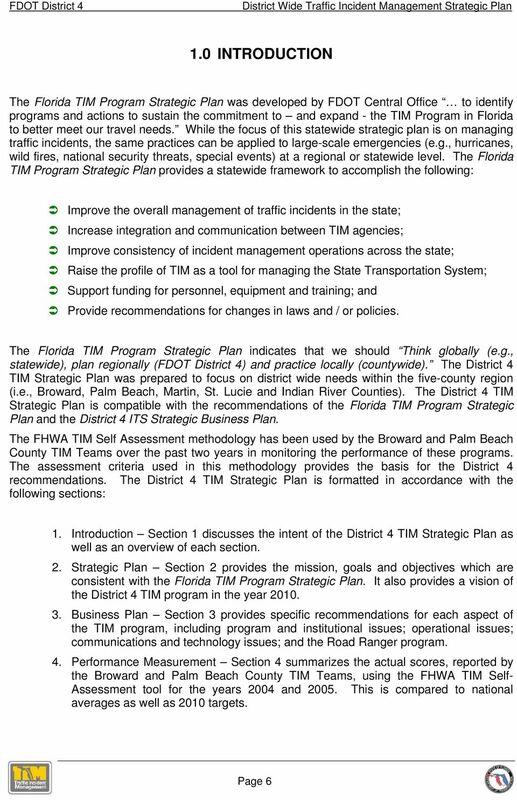 This District Wide TIM Strategic Plan provides specific recommendations to advance the program using input from the TIM Teams and the following resources as guidelines: Florida TIM Program Strategic Plan (Reference 1); FDOT District 4 ITS Strategic Business Plan (Reference 2); and the Federal Highway Administration s (FHWA) TIM Self Assessment Methodology (Reference 3). 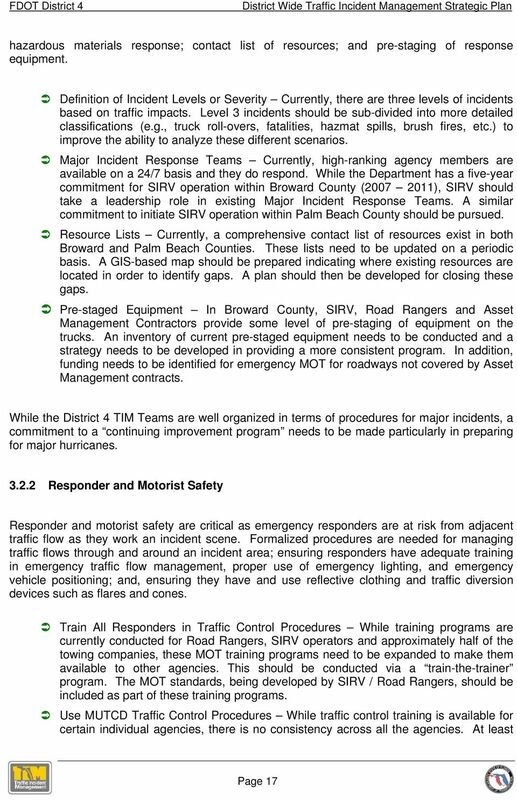 The strategic plan timeframe covers the years Based on this approach, the following recommendations are made to support the District 4 TIM Strategic Plan: SIRV Program Funding should be identified to support a SIRV program to cover Palm Beach County, similar to the coverage provided in Broward County, in taking a leadership role in serving as the on-scene FDOT representative in coordinating incident management with emergency responders. 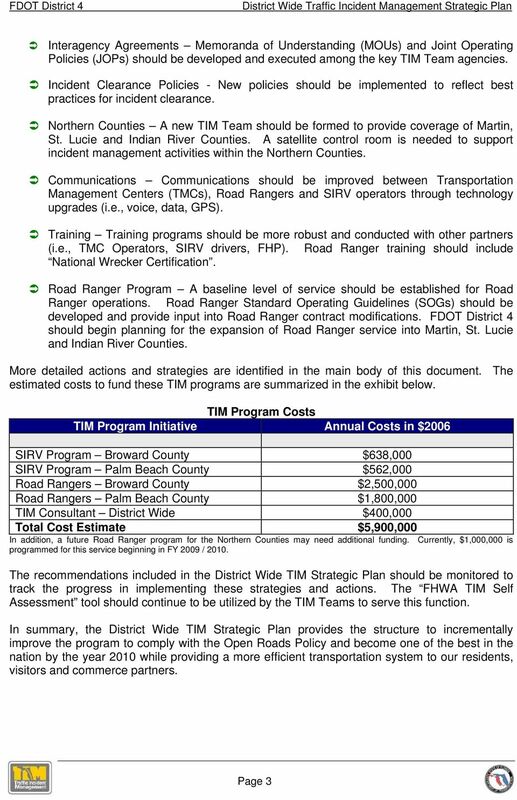 Traffic Incident Management Tribal Safety Champions Workshop November 17, 2015 Richard Jurey Federal Highway Administration Workshop Overview SHRP2 Traffic Incident Management emergency responder training. 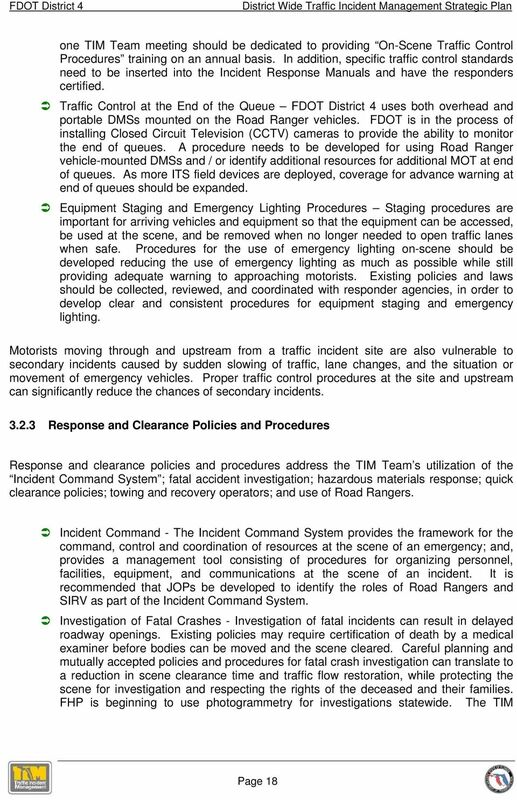 Traffic Incident Management Where are we focused? Captain Mike Prochko Arizona Department of Public Safety Highway Patrol Division mprochko@azdps. LAW ENFORCEMENT. B. In the event of major disaster, outside resources may not be available to provide support. 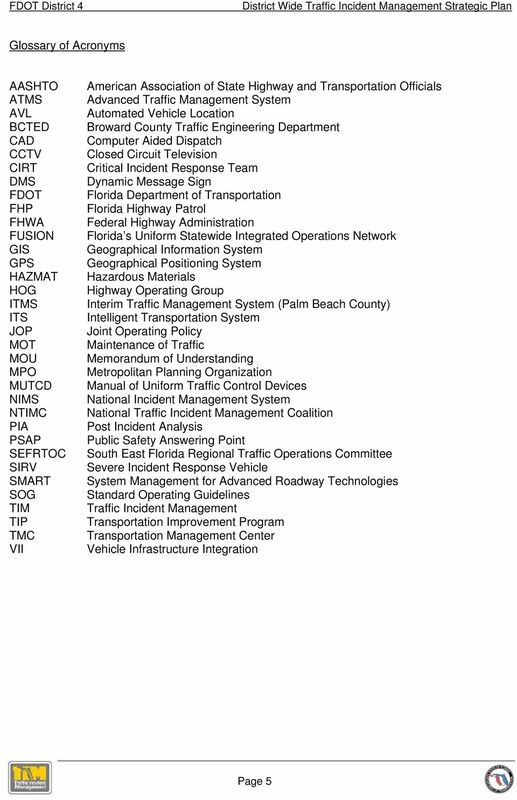 It also provides guidance for rapid alerting and warning to key officials and the general public of a potential or occurring emergency or disaster.